The beautiful islands lining Croatia’s coast are home to some of the country’s most epic food. Get to know about the ingredients, dishes and wines that make these rich culinary hotspots well worth the short ferry ride from the mainland. Croatia is home to an astonishing 1,244 islands, islets and crags, many of which offer some of the most stunning views and weather in Europe. The whole country has quickly become one of the fastest growing tourism destinations in the world, as more and more of us get to know about its beauty and culture. And while Zagreb further inland is growing in popularity and the beautiful coastal city of Dubrovnik attracts the majority of visitors every year, those in the know head to the islands of Croatia’s central and southern Dalmatia region for a picture-perfect getaway. 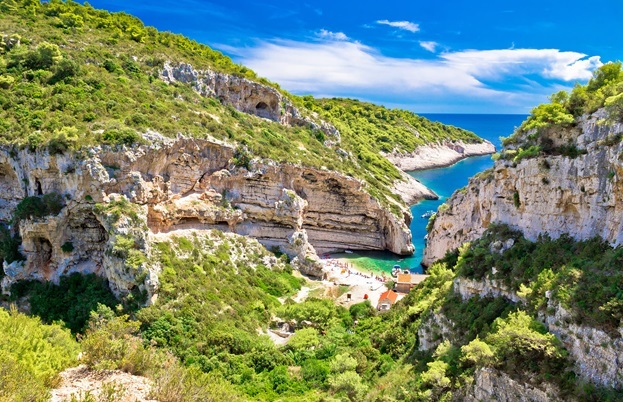 There are myriad reasons to visit Croatia’s various islands. There’s glitzy nightlife on Hvar; ancient Greek and Roman history on Mljet; untouched nature on Vis and world-famous beaches on Brač. And despite their close proximity, each island has its own food and wine culture, often with ingredients, oils and wines that can’t be found anywhere else in the world. As a general rule, if you’re a fan of fish and seafood then a trip to a Dalmatian island should be high on your list. Small day boats bring in the freshest catch every day, with lobsters, sea bass, octopus and mussels prepared simply and turned into stews or soups. 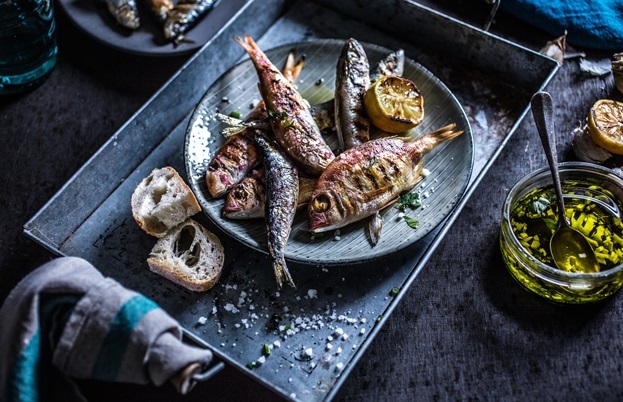 The beautiful sunshine also means many fish – particularly sardines – are simply grilled over coals and served with a generous glug of olive oil and some simple seasoning. Peka is Dalmatia’s most famous dish, often featuring octopus, lamb or goat cooked in a pot under a bell-shaped lid in the embers of a fire, and is served on most of the islands. Many of the region's dishes are also given a quintessential Dalmatian flavour thanks to motar, a type of pickled samphire that’s only found in the southern parts of the region. 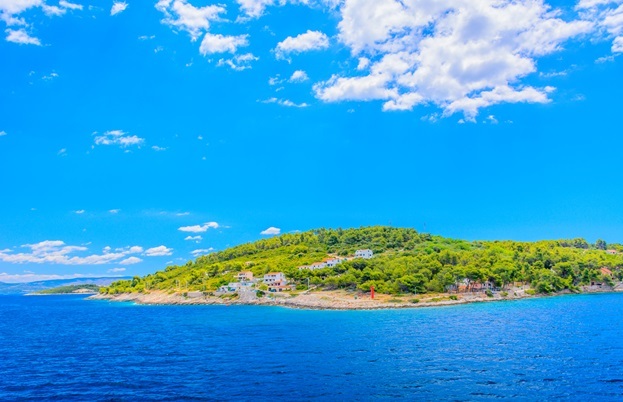 Many of the Dalmatian islands are also home to vast olive groves which produce some of the best olive oil in the world, as well as vineyards making use of indigenous grapes. But these shared characteristics certainly don’t mean each island is the same. Take a closer look at the six most popular destinations below to learn more about their unique culinary offerings and what to eat, explore and experience when you’re there. 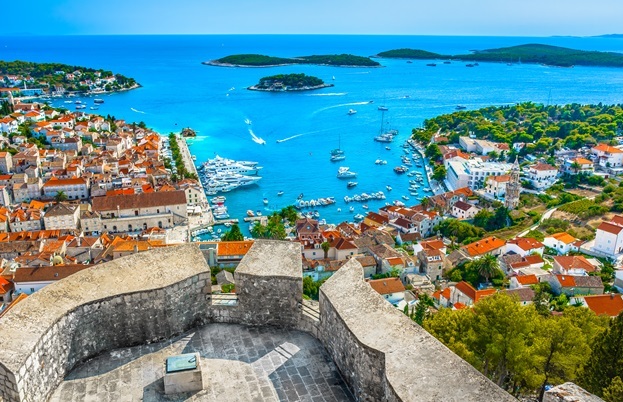 The island of Hvar boasts being the sunniest spot in all of Croatia, and come summertime people flock to its beautiful beaches to soak up the rays. The harbour front welcomes a unique blend of well-heeled socialites and a younger crowd that venture to the beachside bars to see or be seen, but in both Hvar Town and further inland there are some incredible places to eat. Giaxa – housed inside a stunning fifteenth century palace – takes local favourites and reinvents them for a contemporary audience, while a gentle stroll along the coast will bring you to Restaurant Robinson, a beautiful tucked away place that’s been serving traditional Dalmatian dishes for over thirty years and cooks fish so fresh you can often watch it being brought to the kitchen direct from the boat. Do book a table at DiVino, too, which offers incredible food with views across the Pakleni Islands (which happen to be home to two more standout restaurants, Laganini and Zori). And if you're after true, unspoilt luxury, the mini island of Palmižana is where you'll find it – along with a very famous restaurant run by the historic Meneghello family. As you’d imagine, fish dishes make up a large part of Hvar’s local cuisine and the dish that celebrates the daily catch in all its glory is gregada. This fisherman’s stew is cooked in a clay pot and combines several varieties of fish and shellfish with anchovies, potatoes, capers, onions, parsley and garlic in white wine, and is a must-try when on the island. In fact, all the fish served on the island is as fresh as can be and cooked simply to allow its natural flavour to shine through. Goats are also reared on Hvar and their milk is turned into a variety of delicious cheeses, served with fresh herbs and a drizzle of the island’s own olive oil. Among the olive groves are also lots of vineyards, which produce some of the finest wines in all of Croatia, continuing to celebrate traditions dating back to ancient times. There are several indigenous grape varieties on Hvar, and many producers create fine examples of Prč, Vugava and Bogdanuša, three incredible white wines. It’s also known for producing incredible examples of Plavac Mali, a Croatian red wine, and Prošek, a sweet dessert wine. 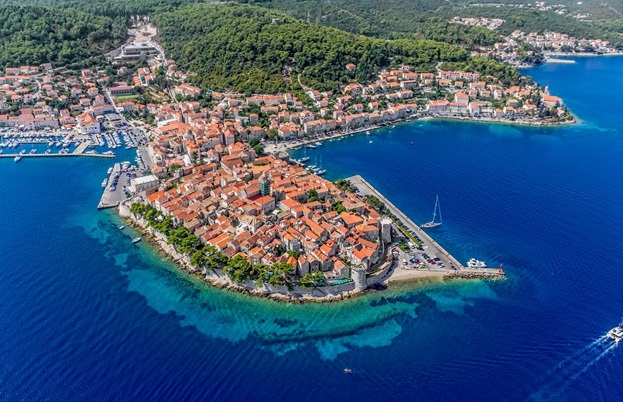 To the south of Hvar lies Korčula, a thin, long island famous for its dense forest, beautiful examples of medieval architecture and being the birthplace of Marco Polo. As it isn’t as touristy as places like Hvar it’s the perfect place to avoid the crowds in high summer, with just as many beautiful beaches and coves to explore outside the Old Town (which is known as ‘Little Dubrovnik’ thanks to its pretty buildings). For fine dining you can’t get better than LD Restaurant, which takes inspiration from all along the Adriatic, and for a more traditional, rustic, buzzy experience head to Adio Mare, which has been an island favourite since the 1970s. There's also Konoba Mate, a family-run restaurant which uses produce from its own farm. Korčulan olives are highly prized throughout Croatia, and the island’s local olive oil is definitely worth seeking out. 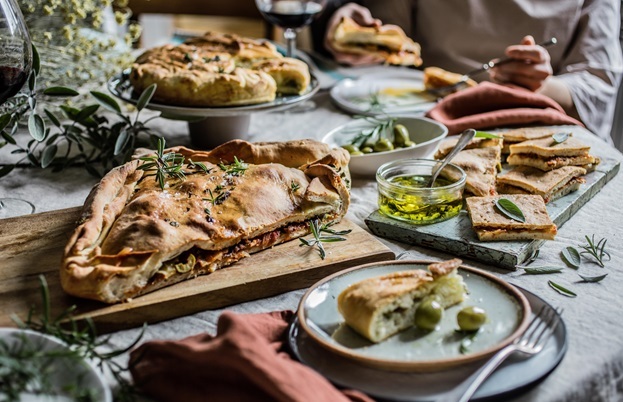 The fertile soil of the island makes it perfect for growing vegetables of all kinds, so expect plenty of artichokes, peas, broad beans, asparagus and even carob when in season. Fantastic fish and seafood is everywhere but there is a definite lean towards beef on Korčula, often served as Korčulanska pašticada (a local speciality of beef braised in red wine with prunes) or Žrnovski makaruni, a fresh pasta dish in a rich beef sauce. Wine lovers should seek out the dry white Pošip and Grk varieties, which are staunchly Korčulan. 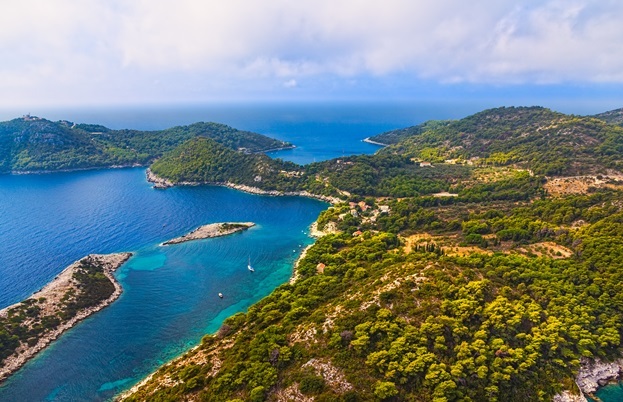 The southernmost island of Croatia, Mljet is covered in dense forest and home to Mljet National Park, which occupies the majority of the landmass. 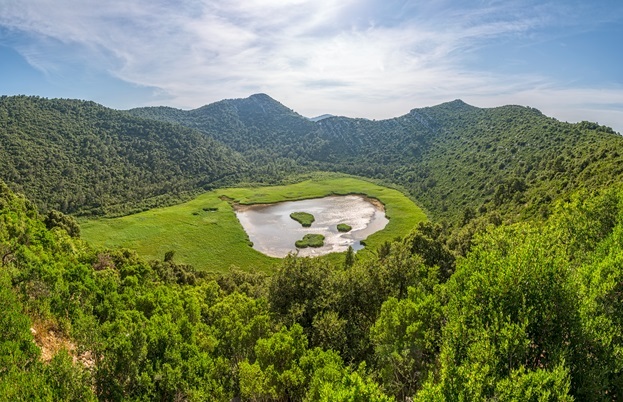 There’s also plenty for history buffs to sink their teeth into – Mljet is mentioned as early as the fourth century BC and is home to the second largest Roman palace in the country. There are fewer restaurants here than on the busier islands like Hvar, but it’s worth making the trip to the konoba (the local term for a restaurant) Stermasi, which overlooks Mljet’s east coast, and Mali Raj, set in the heart of the National Park beside a lake. Dishes on Mljet tend to revolve around simple grilled seafood, particularly octopus, but go further inland and you’ll often find goat on the menu (along with plenty of goat’s cheese). The more unique dishes of Mljet include Mljetski makaruli, a local pasta garnished with olive oil, goat cheese, thyme and garlic, and Zelena menestra, a chunky soup made from collard greens, potatoes and cured pork. Further out into the Adriatic Sea west of Hvar lies Vis, an island that was home to various military bases (including Fort George, built by the British in the early nineteenth century, which also happens to be the birthplace of the oldest cricket club in Europe) and therefore inaccessible to visitors until 1989. Today it has reinvented itself as a beautiful attraction for nature lovers and gourmands, thanks to its untouched landscapes and the strong fishing culture that continues to thrive today. Be sure to visit Konoba Roki’s, a restaurant at an inland vineyard, or the fantastic Restaurant Pojoda on the coast, which is known to serve some of the finest fish in all of Dalmatia. The lemon groves and fig trees of Vis produce famously good fruits, and these go into the islands favourite desserts. Hib is a dense cake made from dried figs, fennel, herbs and brandy which is now enjoyed throughout southern Croatia, and arancini – not to be confused with the Italian rice dish – is candied orange peel. 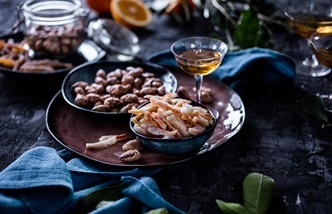 Savoury dishes often include salted anchovies, capers and olives, which were traditionally relied upon for sustenance in Vis during the winter. Grilled sardines are fantastic on the island as they’re always so fresh, and there are two stuffed focaccia-like breads which have become famous throughout Croatia: Viška pogača (an ancient dish of bread filled with salted anchovies and onions and cut into triangles) and Komiška pogača (filled with anchovies, olives, capers and tomato and cut into squares). Think of them as like a cross between a pizza and a pie made with light, fluffy bread. 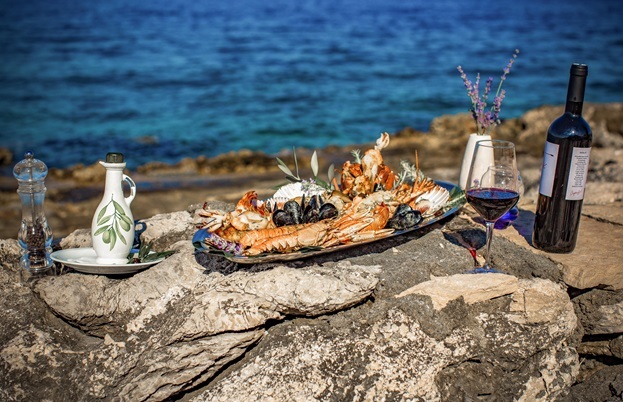 All the food on Vis goes perfectly with the island’s wines – a famous white called Vugava and a red called Plavac. 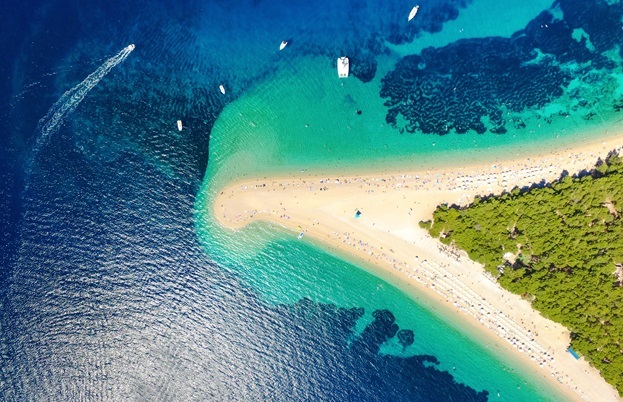 From the mainland city of Split in central Dalmatia you can travel to Brač, which sits above Hvar and is home to a remarkable white-pebbled beach called Zlatni Rat. People tend to be drawn to Hvar and Korčula for a bustling atmosphere, making Brač a more tranquil, peaceful place to visit. For restaurants it’s best to travel into the centre of the island, where you’ll find places like Kopačina – a gastronomic temple to lamb in all its forms – and Kaštil Gospodnetić, which is on a family farm and serves a fantastic pašticada (Dalmatian beef stew). 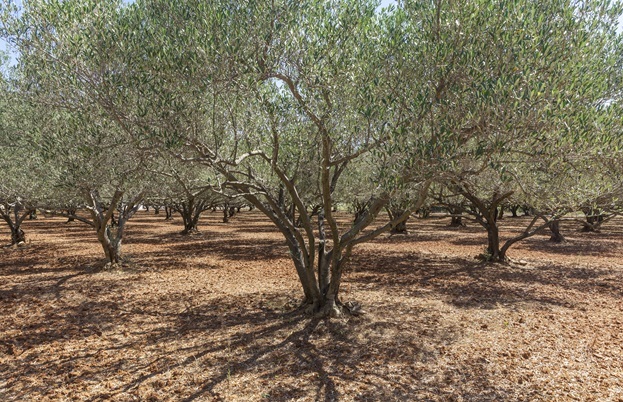 There are an estimated million olive trees on Brač, many of which bear Oblica olives. These are harvested by hand and pressed into some of the finest olive oil in the world. In fact, olive oil is so important to the island that there’s even an olive oil museum! A generous splash of local oil is usually used to dress the lamb and goat dishes enjoyed on the island, the most famous of which is Vitalac. Liver, heart and lungs are wrapped in intestines and gently cooked over coals for several hours, before being served as a starter while people wait for the rest of the lamb to be cooked. If that’s a little too adventurous for your palate, then keep an eye out for butalac (herb-stuffed leg of lamb braised in red wine) or tingul (braised lamb). Be sure to try Procip, too – a famous fresh sheep’s cheese that’s sliced and baked in caramelised sugar. 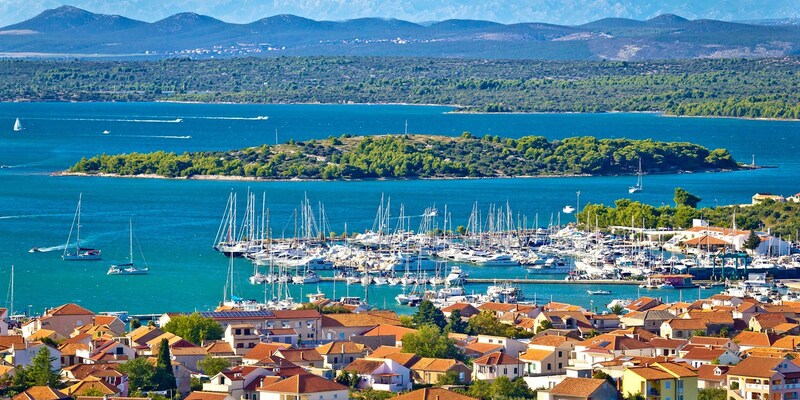 Right next to Brač is Šolta, a smaller island with azure waters and pristine white beaches. Just twelve miles long it is, for the most part, left untouched, which makes it a quiet, relaxing place to visit. The villages dotted along the island’s coast are small, which means there aren’t a huge amount of restaurants to choose from, but there’s definitely a sense of quality over quantity here – head to Pasarela in Rogac for incredible fresh fish by the sea, or try Martinis Marchi in the centre of Maslinica, which is located inside an historic castle and serves Mediterranean cuisine at the highest level. 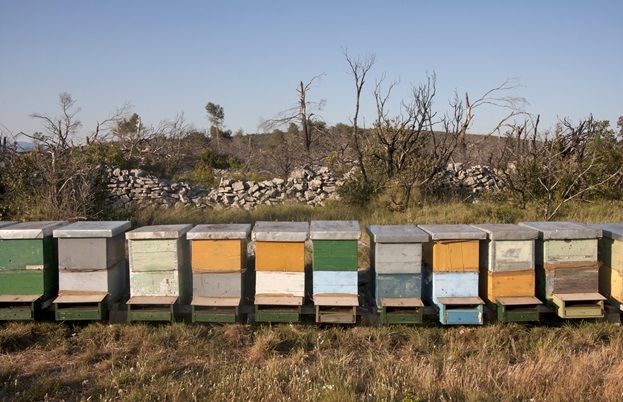 Despite its small size, Šolta is famous throughout Croatia for its honey, as the bees kept on the island have a wonderful array of wild flowers and herbs to feed on, which comes through in the final product. Olive oil is also important to Šolta, and it is produced by hand in small batches by artisans who often infuse it with sprigs of the wild rosemary found all over the island. Keep an eye out for Šolta’s Dobričić red wine, too, which is made from indigenous grapes.